I always feel a great thrill when I go out to buy roses. For me it's not just retail therapy, it's the anticipation of what's to come. When I hold a rose plant in my hand, it may be nothing more than a bunch of twigs and a few roots ' but I can see past that. I can imagine the rose growing in my garden and how it will transform a particular area. I can see the colour of its flowers and I can almost enjoy its scent. It pays to do a little bit of homework in advance of buying a rose. You need to ask yourself several questions, starting with, 'Where do I want this rose for?' Many of us fall into the trap of buying a plant and not having the proper spot or place for it. We end up with what looks like an intensive care unit on the side of our patio ' loads of plants all sitting in pots, all those impulse buys, and all without a proper home. So having the position already worked out for the rose you're buying is the first step. The next major consideration is soil quality. If your chosen planting spot has poor-quality soil, it will really pay do to some work on it beforehand. I'm a great believer in the saying 'You get what you pay for' and the same applies to buying a rose. If you buy bargain offers, you can end up with poor and inferior plants, so be cautious. That rose might look really good in a flyer that comes with a gardening magazine, but when it arrives, you may be disappointed with its size and quality. It really is worthwhile to invest some money in top-quality plants. You need to go to a reputable grower or a reliable garden centre who offer quality stock that they're prepared to stand over. This will ensure that you're getting the variety that's true to name and that you're also getting a plant that has been grown to point of sale by a professional nurseryman. If you're really keen to buy quality, hard-to-find roses, I recommend you approach some specialist rose nurseries. These are growers whose nurseries are devoted to nothing but growing and selling roses and their reputations are based on the quality of what they produce. Otherwise, for buying roses in general, I recommend going to a quality garden centre where you can seek the advice of professional staff. Traditionally, roses were sold as bare-rooted plants. This means that they were lifted from the ground while dormant in winter, their roots were wrapped and protected from drying out, and they were sold for immediate planting, provided weather conditions were suitable. 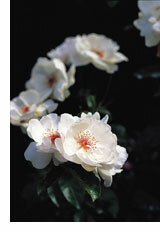 Bare-rooted roses are still sold and are available from garden centres today. 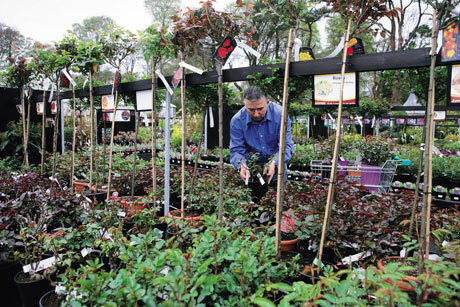 Many of the specialist rose nurseries, sell their roses this way, too. You can buy a bare-rooted rose, it has usually been cut back sufficiently so that there is no need for pruning, except if you find some dead or broken growth. When you're selecting a bare-rooted rose, make sure that the root system hasn't been allowed to dehydrate. You're looking for a rose that has been freshly lifted, with its roots well-wrapped to protect them from drying out. Also check that the roses are clearly labelled and that the stems look fresh and healthy. Avoid those with damage and, if possible, avoid any with die-back, where the tops of the stems are turning brown. Pre-packed roses are usually bare-rooted roses sold in supermarkets and hardware-store chains. They have the advantage of being inexpensive, but a word of caution is needed. If these roses are left in the packs too long, they may start into growth too early and you may end up with long, straggly growth within the bag. This is to be avoided at all costs. Also, depending on where they've been stored, pre-packed roses are prone to drying out, and they'll die before they ever get a chance at growth. 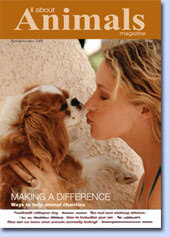 So just be careful and make sure that you examine the rose carefully before purchasing. You can get some good buys, but you can also have some disasters. Container-grown roses are plants that are established in pots. They are available for planting all year round, but you should avoid planting when the ground is frozen, if the soil is too wet, or if it's too dry. They can even be planted when they are in full flower, which allows the gardener a longer period for planting and gives you the advantage of being able to select a healthy rose which you can see in flower. Container-grown roses are always a little bit more expensive, as you are paying for an established plant. The advantage of planting a container-grown rose is that it settles in quickly and gets off to a great start. 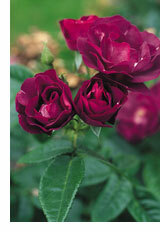 When buying a rose, look for a plant with a minimum of two or three strong, healthy stems. I put more emphasis on having good, healthy stems than on the quantity of stems. These stems should ideally be green and fresh-looking with no sign of wrinkles. In the dormant period, the buds should just about be visible. Have a look at these to make sure they look fresh, too. If you are buying container-grown plants, look for really good, healthy foliage. Avoid any roses that have signs of disease, as well as any with yellowing leaves. The foliage should be bright and clean. I also recommend that you check that container-grown roses are not pot-bound. This indicates that they have been growing in the pot for too long and the roots have become compacted. It's easy to check for this by gently tipping the rose out of the container. However, if you're doing this early in the year I recommend caution because the rose may not yet have become established in its pot. You'll end up with compost everywhere and a rather embarrassed look on your face! Ideally, what you're looking for is a well-developed root system. The roots should look healthy and white and not overcrowded. If you have any questions when you are buying, don't be afraid to ask a member of staff for advice. Good garden centres are always happy to help. T his award-winning rose created great excitement when it took centre stage in the rose world. Hailed as the first near-blue rose, it certainly captured the collective imagination and was voted Rose of the Year in 2003 by global panels of experts. On top of this, Rhapsody in Blue has received numerous awards for its exceptional fragrance - fruit notes of peach, lemon and honey come to mind. I wasn't sure I'd like a blue rose but, on my first encounter with it, I wasn't disappointed. Its colour is extremely pleasing and easy to use in the garden and I imagine it's a flower arranger's delight as it's so different to all the other roses we grow. Renowned plantswoman Helen Dillon grows it to visual perfection in her Dublin garden, combining it with Salvia verticillata 'Purple Rain'. To sum up, I think it's fair to say that this isn't just a novelty rose, but is one that's quickly establishing itself as a first-class garden plant - definitely a plant with the 'X factor'. I recommend you try it. Introducing an arch into your garden can add instant height, which is especially valuable if you're restricted on space. If you're thinking of doing this, you might like to consider growing this fabulous rose. It's one of the most beautiful and romantic of all the climbing roses. Soft, shell-pink, delicate petals, which fade to almost white, make up sumptuous cup-shaped flowers that open to expose the central stamens. David Austin describes the flowers as being like waterlilies. To add to their charm, the flowers nod gently from their stems, creating a billowing effect. There is a spicy quality to the fragrance of this rose; it's a combination of scents such as myrrh and musk with the added sweetness of old rose. Though the flowers have a delicate, ethereal quality, the plant is quite strong growing and makes an excellent climber. 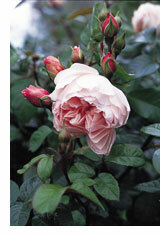 Introduced in 2002, it is highly disease-resistant and is one of the best newer climbing roses to come on the market. In full flower, this looks rather special and one I believe we're going to see more of. I wouldn't be surprised if it ends up becoming a real classic. Jacqueline du Pré sports a large semi-double to single bloom of great charm and beauty. The colour is a creamy white and the reverse of the petals is a soft, glowing pale pink. This is a rose that looks magical when the blossoms are lit from behind by sunlight; every flower seems to glow like a bright orb. The long, salmon-pink filaments are dramatically positioned in the centre of the bloom, leading your eye in and enhancing the overall purity of the colour by contrast. The flowers appear in clusters of between three and twelve, the foliage is healthy and dark green and the stems are prickly. Jacqueline du Pré needs deadheading after flowering and requires little pruning. In full flower this is a rose with a character all of its own. It's stunning grown in a pot or container, but make sure that the container is large enough, as this rose really resents the extremes of drought you can get if you use a small pot. 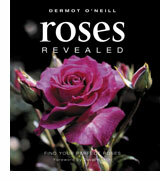 Roses Revealed by Dermot O'Neill is published by Kyle Cathie Ltd, priced £25. Readers can buy the book at the special price of £18 inc free p&p (UK mainland only).